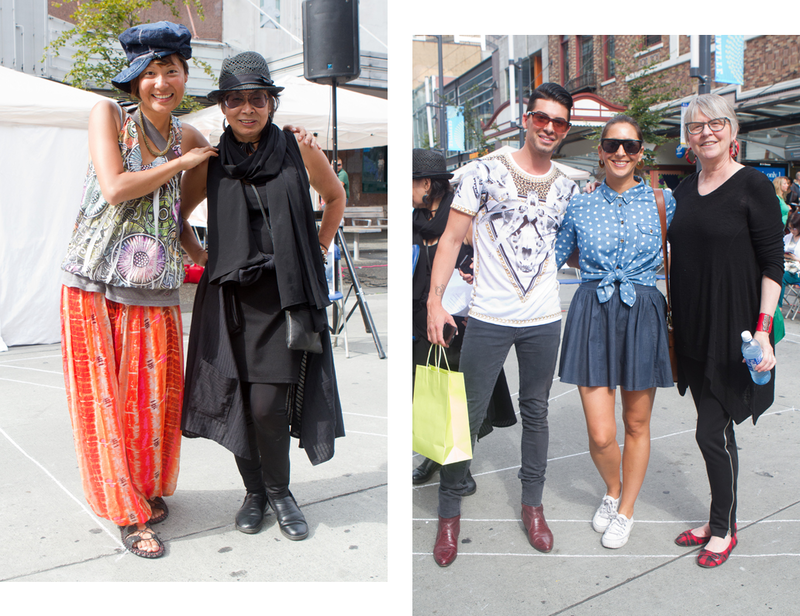 Blim Market on Granville Street was the location for the most recent fashion show by Yasuhiro Tomita (Tommy to his friends), the talented artist behind the RUKUS label. We are very fortunate to have such a unique designer here in Vancouver and the chance to view his new collection at a free show was amazing. First a bit about Blim Market from their website - "BLIM is an independent, family-run art and craft facility now conveniently located in the heart of Vancouver’s Historic Chinatown. Our aim is to help build community through the spirit of fun and creativity, making the arts and crafts accessible to a wide range of skill sets and aims. Think of it as both a resource and platform for artists, a non-funded arts facility and small business run by and for artists." In addition to their storefront, they run several events over the year in locations such as Granville Street and the Heritage Hall. This fashion show was a charity fundraiser for rare disease patient support. There are over 7000 rare diseases without cures around the world and the small number of patients mean very few dollars go into research. Muscular Dystrophy - one of these rare diseases - hits particularly close to home as Tomita is facing this health challenge. It is a progressive genetic disorder that causes deterioration of the muscles and eventually leads to muscle wasting, muscle weakness, bone deformities and disability. The designer has become a volunteer Qigong Healer and explored crystal healing macrobiotic, homeopathy, naturopathy and more. Through online campaign and donations collected at the event, this event raised a whopping $1800 which was donated to a society offering support to those suffering from this debilitating disease. MC Yuriko Iga from Blim Market welcomed us, talked a bit about her organization and mentioned a few upcoming events. Next opening speaker Aki Nakaoka shared her experiences and thoughts on suffering from a rare disease. 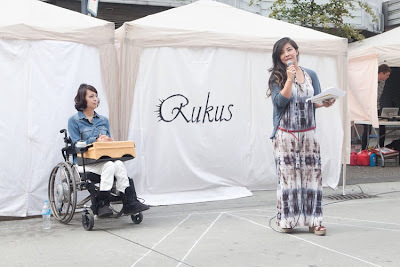 Now in a wheelchair, her words hit home. ""In Japan, patients and their family are all by themselves and isolated from the rest of the communities due to the absence of drug development and remedy research..." Next actress Mayumi Yoshida took the microphone to offer a dramatic reading from Nakaoka's book - once in English and once in Japanese. 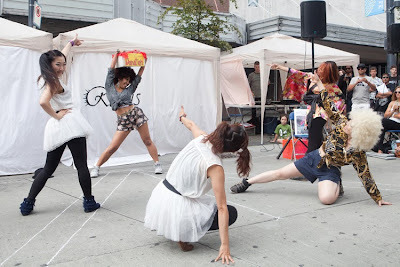 Then it was on to the two fashion shows - produced by the one and only Keiko Boxall (Studio Keiko) with an energetic dance performance by La Douche offered in the intermission. Tomita has been challenging the Vancouver fashion market since his arrival in 2011. He offers a line of unique jewellery created with precious and semi-precious stones and cutting edge clothing for the more daring fashionista all infused with his own very original point of view. For the show at Blim Market, he divided his Resort Wear 2014 collection into 2 shows with very diverse inspiration. The first half focused on the cults and darker sides of Vancouver. He even designed his own three skull image seen on the tops. The palette was predominately black balanced with offerings in white and grey. The fabric of the grey knit skirt - reminiscent of bones - is his own creation as well. Garments in the second half - also a part of his Resort Wear 2014 collection - were influenced by Asian and Middle Eastern religions. While black and white anchored the palette, more colour was incorporated in this selection of looks through the inclusion of bright prints inspired by the jungle and insectivores. Although this fundraising campaign is now finished, the designer and Qigong Healer will continue in his support for those afflicted with this debilitating disease. There is always hope and that includes not just more effective treatments, but a cure. Automation One, Body Project & Co., Equine Spirit, Reiki, Sasaki Art Gallery, Tama Organic, Nikka Health Care Society, Rukus, Studio Keiko, SORD, Free X Free Project and SKUA.